This Muddy Pond's Sorghum Syrup is 100 percent pure sorghum with no additives made from their own sorghum cane that they plant each year. The Muddy Pond Mill is operated by the Guenther family and is located midway between Nashville and Knoxville in the hills of Tennessee. Sorghum cane is typically harvested during September and October. Juice is extracted from freshly cut plants and that bright green juice goes back to the mill, where it is heated in a holding tank; cooked and thickened into light amber syrup that is then bottled. 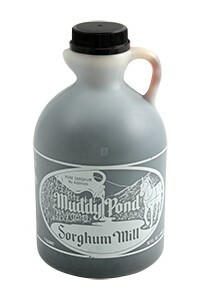 Muddy Pond Sorghum has won many awards and honors. Store sorghum at room temperature. If it begins to crystallize, put it in a pan of warm water and it will become syrup again.